He’s a warrior and member of a team. His eyes follow a red laser beam. He walks cautiously through the enemy’s hostile territory with his muscular hand wrapped around his gun. With his finger tightly gripped, he’s ready to pull the trigger. He always thinks of himself as bigger. He sees the enemy as little. As someone that can always be conquered. He’s a U.S. Soldier that never accepts defeat. He’s always quick to his feet. He’s a follower of what’s right. And never lets the enemy out of his sight. He’s ready to fight with all of his might. And build the Nation’s might. He’s a guardian of freedom and the American way of life. He’s ready wherever the US Army Platoon arrives at. To be led by his faith in God. He can face any foreign or domestic enemy. He’s a proud American Soldier. He bleeds red, white and blue. 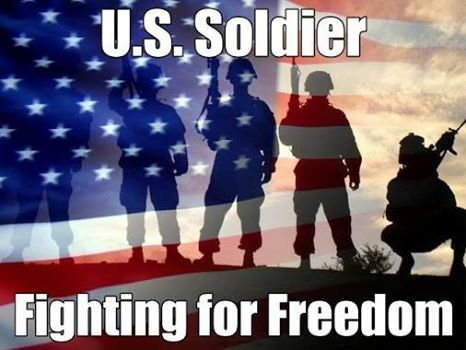 Fighting to keep America’s Freedom and Liberty!